New year, new me in a box. 1. 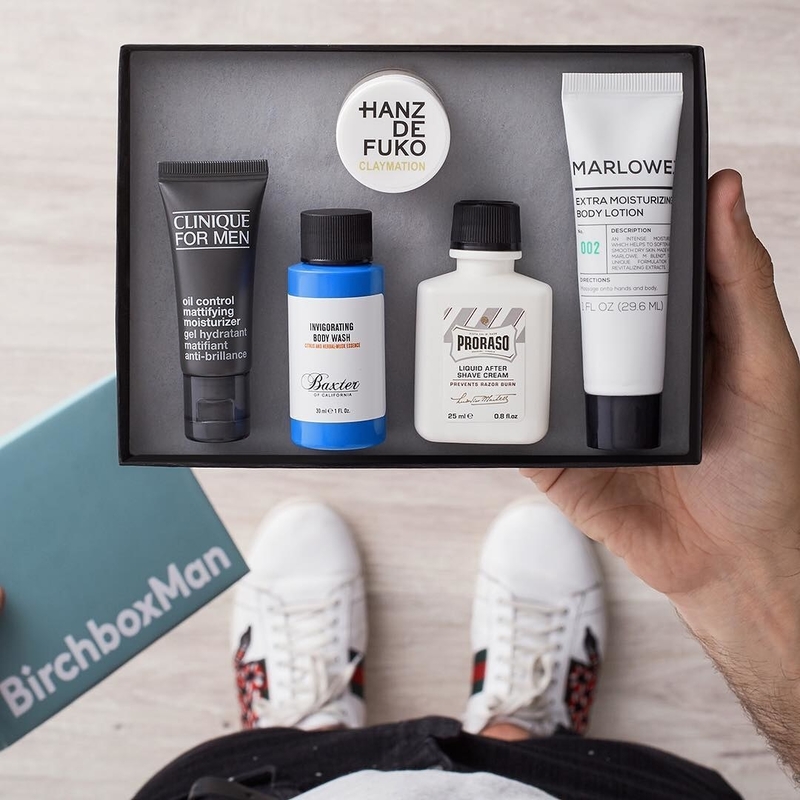 Birchbox and Birchbox Man deliver five "top-shelf" products that will *definitely* shake up your beauty routine — even a casual site browse will prove to you just how crazily expansive their inventory is. 1. All of the products picked out for you by the Birchbox team. 2. Pick one product yourself (out of three choices) and have the other four be a surprise. 3. Choose a pre-curated box so you can see exactly what you're getting before it's sent to you. Other noteworthy info: You typically get a free gift with subscribing, like right now it's a mini MAC Matte Lipstick in Velvet Teddy (with code WELCOMEMAC) for Birchbox and Do Something Travel Dice (with code DICEANDGO) for Birchbox Man. 2. 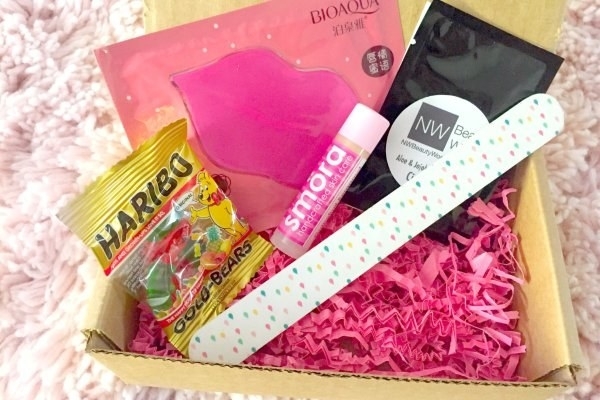 Look Fantastic Beauty Box brings you the coolest brands from across the pond with their own cute li'l magazine giving you the low-down on the month's box (plus a copy of Elle UK, which is a major plus IMO). The gist: Six products that range from sample to full size from brands like Suki, MDMflow, Ciaté London, and Gatineau. 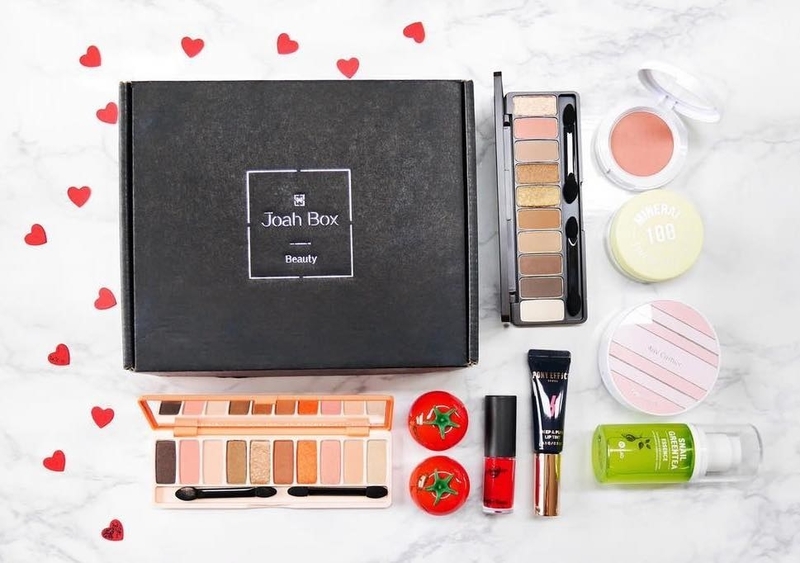 Other noteworthy info: When you join any plan, you're automatically enrolled in the Beauty Box Club, which means you get a copy of Elle UK with each box, the chance to enter exclusive competitions, participate in a monthly Beauty Box twitter chat (expert advice from brands! ), and a chance to try exclusive brands before they launch on the regular site! 3. Walmart Beauty Box ~rolls back~ the cost of sampling awesomely affordable brands/products even more, so you don't feel an ounce of guilt for adding to your collection. The gist: An assortment of samples (and tips!) based on a survey that asks about your ethnicity, skin concerns, hair type, hair styling techniques, etc., which, upon completion, leads you straight to checkout. Other noteworthy info: All surprise products! And there are only four boxes per year, one delivered each season. They also have a special ~pick of the season~, which is currently Olay Luminous Tone Perfecting Cream. 4. Dermstore BeautyFix features an eclectic mix of professional-grade and hard-to-find spa-exclusive products curated by beauty experts that all together retail for $100+! It's a no-brainer, really. Other noteworthy info: Each box comes with a card highlighting and detailing each item in the box, which is super helpful when skincare products (esp high-end ones) can be (while super addicting) really confusing to figure out! 5. 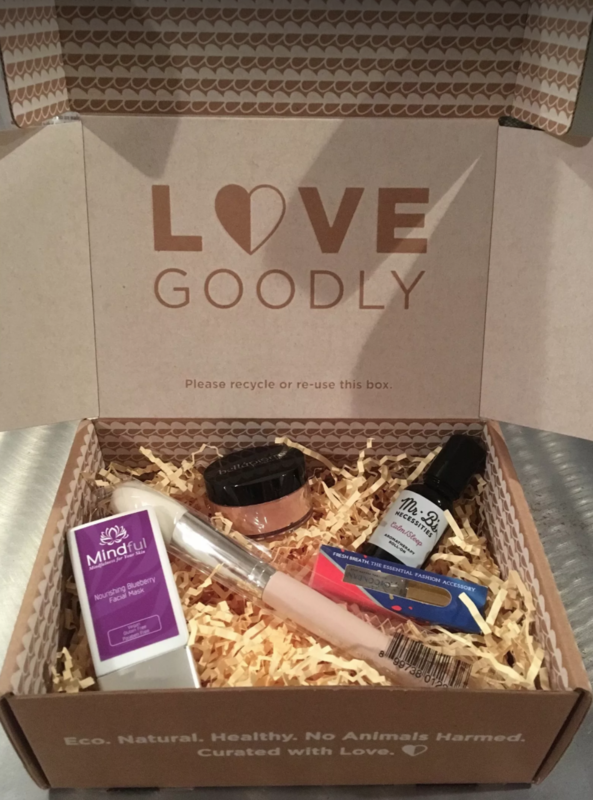 Love Goodly is a super popular vegan beauty and wellness box with guaranteed FULL-SIZED products that promote a healthier, more eco-conscious lifestyle — because we could all do a lil' more good when it comes to our beauty habits, right? The gist: Four to five full-sized products that are all cruelty-free, nontoxic, and vegan that retail for $80+. The VIP box includes another full-sized product with an individual value of over $35! Plus, it's not always strictly makeup or skincare — boxes can include items like a bamboo and charcoal sponge, blush brush, breath mist, and a sleep aromatherapy oil. Other noteworthy info: They also support a ton of deserving causes like Farm Sanctuary, Beagle Freedom Project, and Cure Cervical Cancer because they're just that awesome!! Check a BuzzFeeder's full review here (#8) and here! 6. Play! by Sephora lets you sample all of Sephora's offerings without massacring your wallet (like you usually do). Play date, speed date, whatever you call it — you're bound to have a good time! The gist: Five deluxe-sized makeup, skincare, and hair care samples, plus some sort of ~surprise~ bonus, some of which are tailored for you based on your Play! Profile. 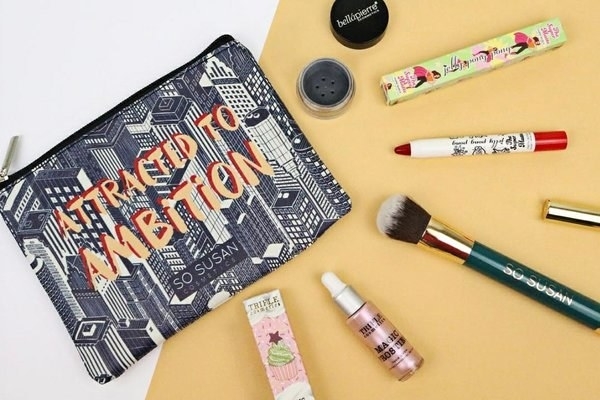 Plus, a collectible, themed makeup bag. And if you ever feel like shopping the (regular- or mini-sized) products separately, check 'em out here! 7. Scentbird has a whopping selection of 450+ designer perfumes to try and test from — each scent lasts an entire month and is TSA-approved so you can always carry your scent around regardless of plans! The gist: Once you sign up, you'll be directed to your queue, which means you can drag, drop, and rearrange an entire year's worth of scents that you choose yourself (by note, brand, mood, etc.)! If you don't choose a scent, they'll just send you the Fragrance of the Month. Also, your "recommended" category will become increasingly personalized for ~you~ as you rate each scent you receive! Other noteworthy info: Free shipping! You also get a monthly $15 credit towards purchasing a full-sized bottle! 8. 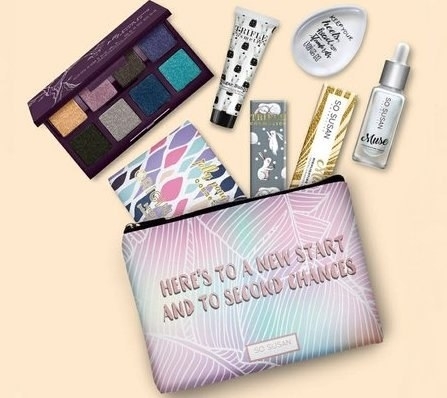 Macy's Beauty Box entices beauty lovers to try out their selection of ~luxury~ products — and they all come in a chic pouch you'll ~actually~ want to keep and use! Taking it back to the days when you used to hop from one beauty counter to the other, sampling everything you could get your hands on! But this is much better because it doesn't require pants!!! The gist: Five deluxe-sized samples, a bonus product, and cute AF pouch. Other noteworthy info: You also get $5 off your next in-store or online beauty order on Macy's! 9. 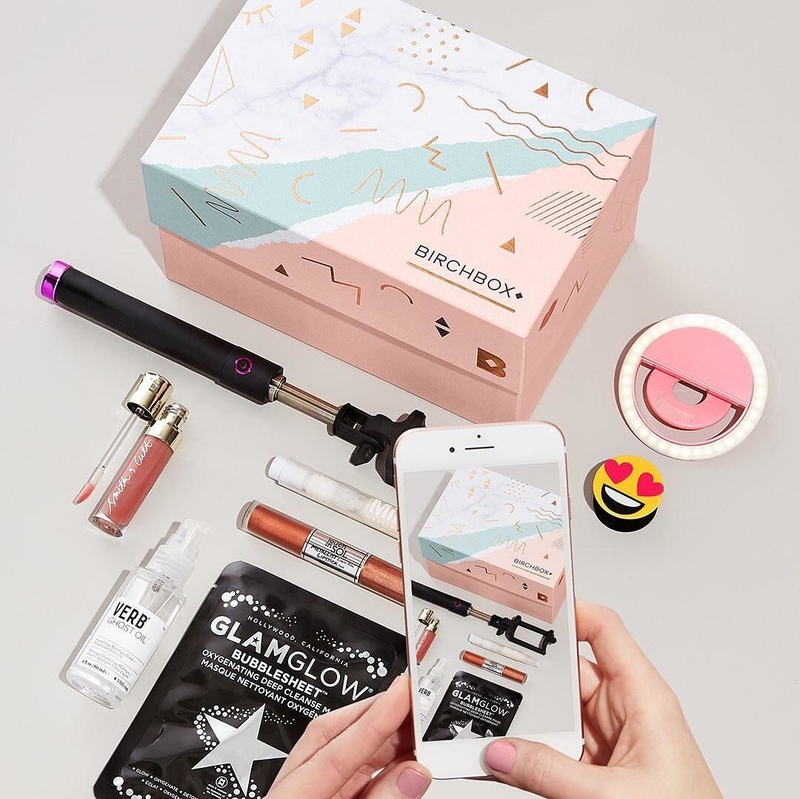 GlossyBox will be your go-to for discovering under-the-radar, indie brands (alongside some more familiar crowd faves) in incredibly chic themed boxes (i.e. "Champagne," "Grateful," and "Fall Elements"). The gist: Five deluxe- or full-sized products that you're probably unlikely to already own (or even know about!). Note: there is sometimes a little variation in the boxes, just fyi. Other noteworthy info: Check out The Glossy Report for all the latest happenings and trends! 10. 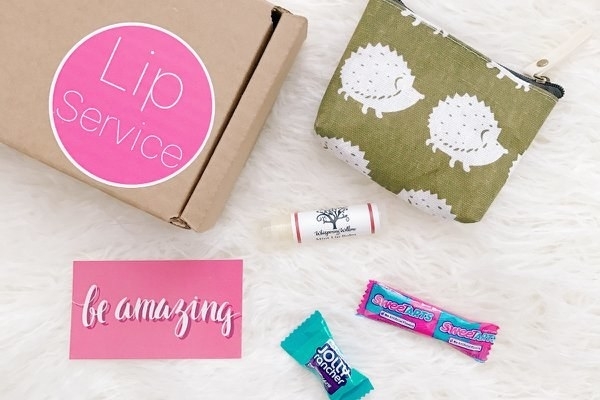 Lip Service keeps it simple (so you don't overclutter your tornado of a beauty collection) for a totally affordable monthly treat: one snazzy new lip balm each month (admit you, you lose 'em too often anyways) and a few small surprises just to make it extra sweet. The gist: One unique lip balm (new brands, new flavors, yay!) and a few pint-sized surprises that could include makeup pouches, candies, notes of inspiration, tea candles, face masks, etc.! Other noteworthy info: All of the little surprises are themed around the lip balm, so you can tell a lot of thought goes behind even something seemingly simple. 11. Color Curate isn't for the pigment-shy — it's got all the products you need if you want to play/experiment with a wider range of colors and ~amp up~ your makeup routine. The gist: Four full-sized vegan, cruelty-free, gluten-free, and paraben-free products (from the namesake brand, So Susan, or other like-minded indie brands like Trifle and Jelly Pong Pong) that retail for $80+, plus an equally colorful makeup bag. Other noteworthy info: Free U.S. shipping! 12. 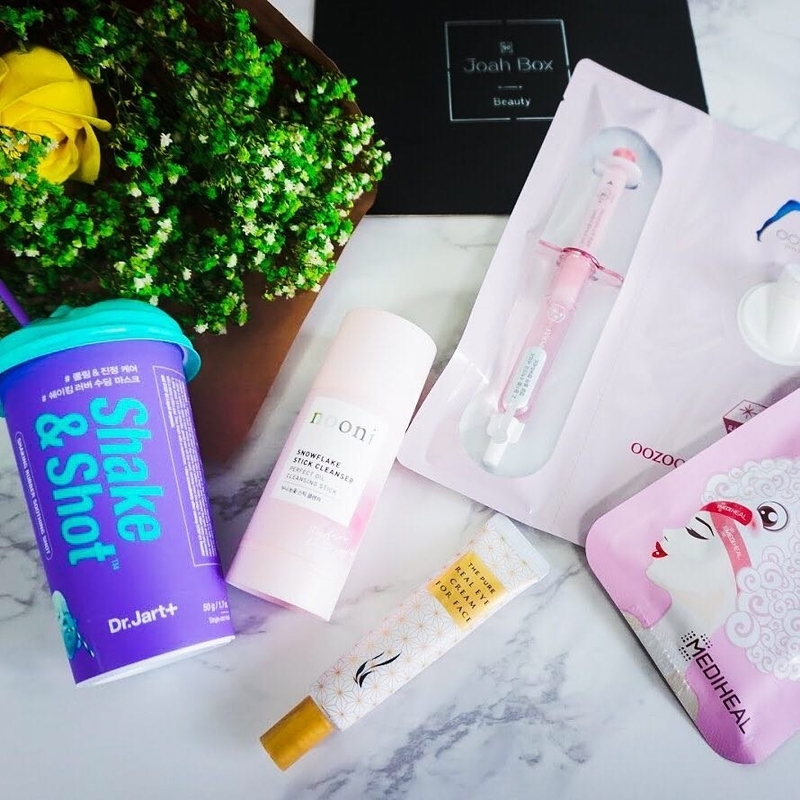 Joah Box calls Seoul, Korea home and ships the latest and greatest K-beauty treats straight from the capital of cuteness and innovation. The gist: Five to seven full-sized products that total up to $60 in retail value *and* more importantly aren't extremely easy to find/purchase in the U.S. (at least without going through sketchy sites and waiting approx. a million years to actually get your stuff). Other noteworthy info: Free worldwide shipping! Seriously. 13. 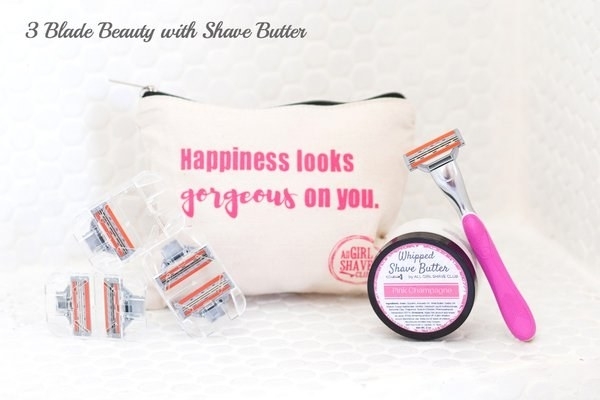 All Girl Shave Club delivers premium razors without the ridiculous price tag, plus specialty shaving and body products you'll be hard pressed to find in your usual personal care aisles. The gist: A "three blade beauty" or "five blade babe" razor for a wonderfully clean, luxurious shave plus complementary products like shave butter, exfoliators, scrubs, and creams from unique specialty brands — so shaving's a pampering experience, rather than a chore. Other noteworthy info: Pink tax, who? And yummy scents like coconut shimmer butter, blackberry masks, and sugar scrubs, and various roll-on oils. 14. FabFitFun might just help you achieve all those ~wellness~ and ~healthy living~ resolutions you make at New Year's but never seem to keep...until now. The gist: Full-sized, premium beauty and wellness products that retail for a whopping $200 value. 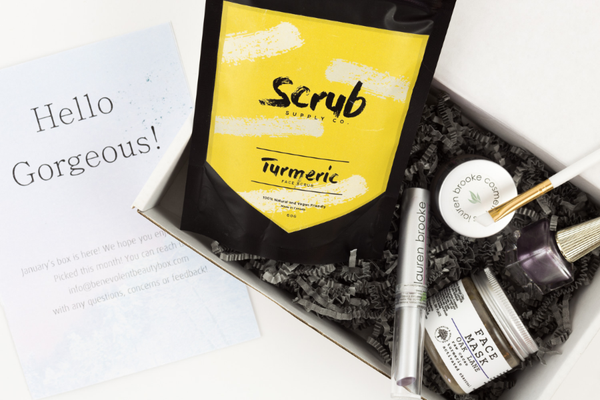 You can choose products & add-ons as you'd like or choose to keep the whole thing a surprise (aka receive a box of products handpicked by the FabFitFun team)! Other noteworthy info: Members save up to 70% on exclusive sales/offers from brand partners, woot! You can also work out anytime, anywhere with FabFitFunTV (new content added monthly). 15. Benevolent Beauty Box makes the search for high quality, cruelty-free beauty products a total walk in the park ::praise hands emoji::. The gist: Four to seven full-sized beauty products that are mostly cosmetics but can include body care, hair care, and tools. Other noteworthy info: You choose your skin tone, color preference (bold, neutral, or both), hair color, and eye color for ~optimal customization~. 16. 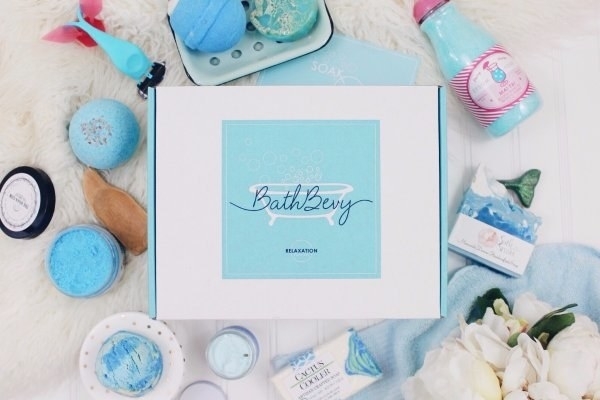 Bath Bevy will probably make you swear off showers for all of eternity with just one whiff of their deliriously relaxing scents. 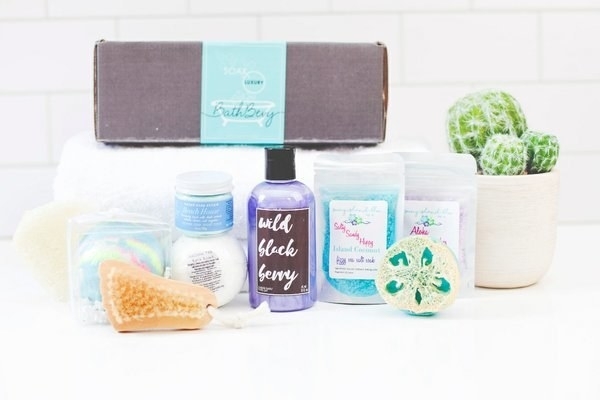 The gist: 6 to 10 items, including bath bombs, bubble bars, bath salts, body scrubs, handmade soaps, etc.! Other noteworthy info: Lots of buzzy independent brands, like Native Deodorant and Etsy sellers like Lillian Violet Soap Co. and Skin Candy Company! 17. BoxyCharm has long been a beauty blogger fave and might be one of the highest value boxes out there, so time to charm your makeup collection into learning a few new tricks. Other noteworthy info: You get access to exclusive members-only offers from esteemed beauty brands, chances to win free products through giveaways, and earn rewards to redeem in their Charm Shop! 18. 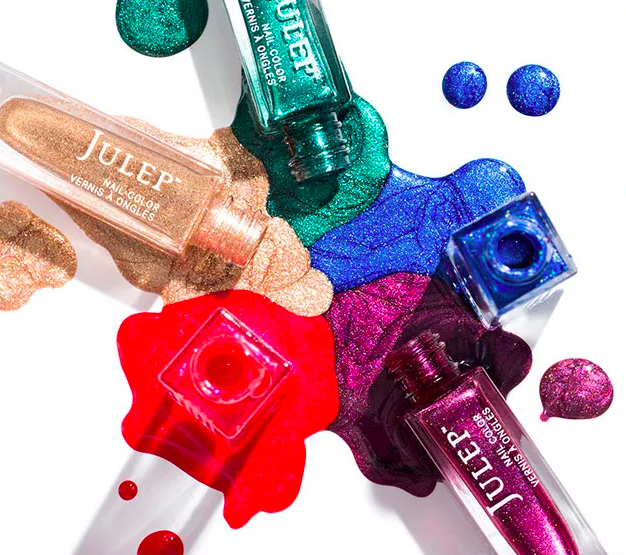 Julep My Maven and Maven Luxe nails the whole "let's make quizzes fun" deal (outside of BuzzFeed, obvs) and lets you customize a box of full-sized beauty, skincare, and/or limited-run nail colors to your heart's content. The gist: Each Julep My Maven Box includes over $40 worth of new beauty, skincare, and/or limited-run nail colors, while each Maven Luxe Box includes over $60 worth of beauty products. Every 20th-24th of every month, the Julep Beauty Boxes are revealed and from there, you can either keep the box that's been curated/selected for you (based on your Beauty Bio populated from the quiz), or swap items in and out to create a box that's even better. Other noteworthy info: If you're feeling extra generous, you can ship your month's box to a friend and give them a beautifully wrapped surprise! BFF award, yes, you'll take it. Plus, there's the ~Secret Store,~ a monthly online pop-up shop where Mavens can score exclusive, limited-time deals (you'll be notified via email). Price: $24.99/month ($19.99/month with a three-month prepaid subscription) or $39.99 ($34.99/month with a three-month prepaid subscription) — you also have the option to skip a month! 19. FaceTory ensures you stay on top of the latest, most innovative sheet mask trends with curated collections that are 100% soothing, pampering, and snap-worthy. The gist: Four fabric-type (i.e. cotton or cellulose) masks OR seven deluxe masks (meaning more varied textures like hydrogel and even multi-step masks, oooh boy). Plus super cute info cards with everything ya need to know about each mask and its benefits! Other noteworthy info: You can also buy individual masks if you want to work your way up to a subscription — plus, you can filter by skin concern, skin type, specific ingredients, and mask material, which is pretty stinkin' cool/useful. 20. Deck of Scarlet equips you with everything you need for a (or multiple) full-fledged lewk: three eyeshadows, two lip colors, cheek color, highlighter, eyeliner, and lip liner. 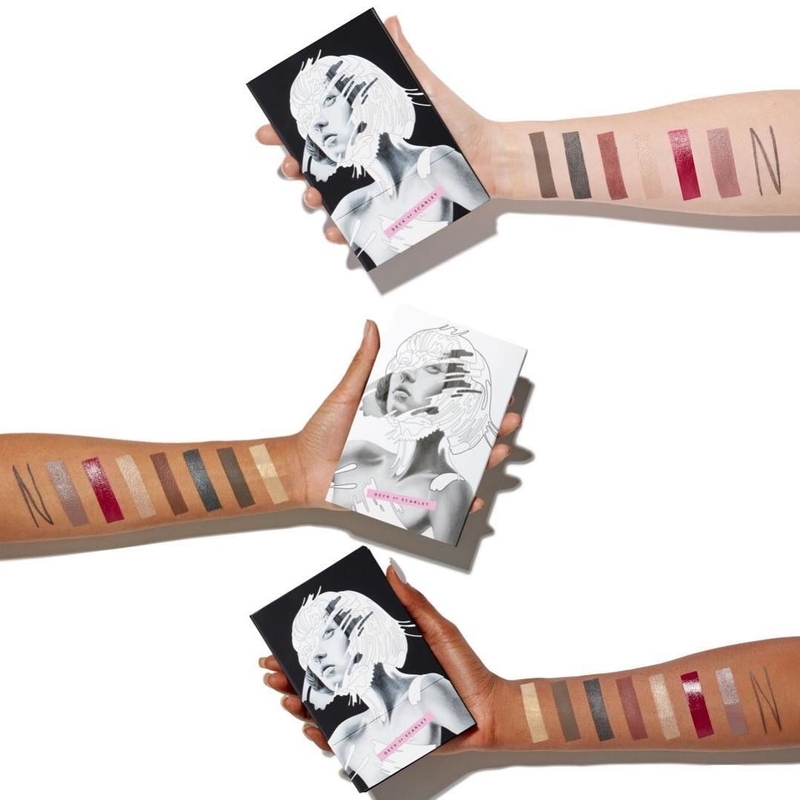 The gist: Each palette is co-created by a cool beauty influencer like Melly Sanchez or Evon Wahab. There's always seven products as listed in the palette pans, but the extra item switches between an eyeliner + lip liner, a dual-ended lip crayon/liner, or just an eyeliner. Other noteworthy info: Free U.S. shipping! And if you're not feeling a certain month's box, just skip it! 21. 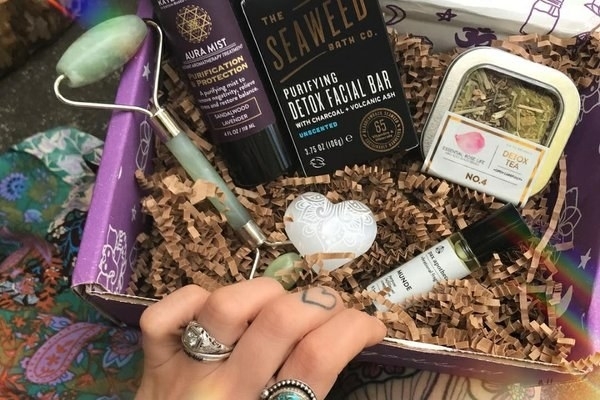 Goddess Provisions is a vegan, cruelty-free assortment of ~lifting~ goodies designed to help you nurture and grow your spiritual practices and experiences. 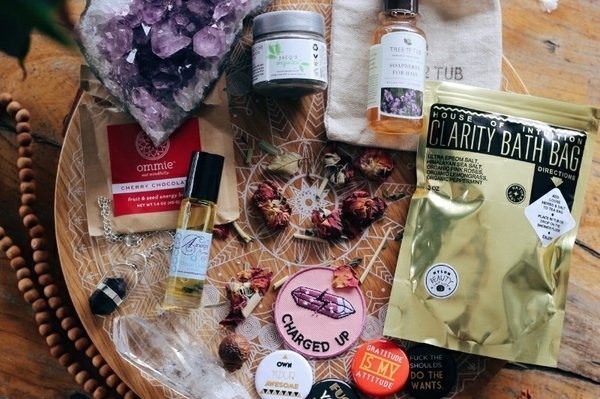 The gist: Four to six full-sized products, totaling $60-$90, including a mix of crystals, aromatherapy, natural beauty products, superfood snacks, and spiritual tools.